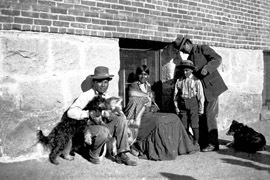 The Schoolhouse at Truxton Canyon Training School, a boarding school constructed to assimilate Hualapai Indians, is located in Mohave County 15 miles southwest of the Hualapai Tribe’s offices in Peach Springs. Local road and railroad arteries affected planners’ decisions about where to put the facility. When workers completed the building in 1903, it was along the transcontinental Atlantic and Pacific Railroad and the Beale Wagon Road, which later became Route 66. Between 1870 and 1930, education was central to United States Indian policy. This policy required mandatory attendance at boarding schools that removed children from their families and communities. Forced to work hard and separated from their families, many students found life at Truxton Canyon traumatic. The regimented lifestyle afforded little free time. Diseases such as measles, influenza, and tuberculosis were common. Some of the older female students adopted younger ones, forming impromptu “families” that helped ease adjustment to the school. 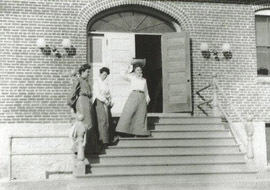 For nearly three decades, the school continued to grow enrolling about 200 students throughout most of the 1920s and 1930s. By then, not only Hualapai, but also Apache, Havasupai, Hopi, Pima, Tohono O'odham (Papago), Navajo, and Yavapai children attended. In 1937, shortly after a Hualapai day school opened in Peach Springs, the Truxton School closed. At the same time, Arizona’s system of roads grew and developed. In 1913, a year after Arizona became a State, the Arizona Good Roads Association published a tour book describing the road past the training school and through Valentine as a “fair road [with] east grades.” Booster groups like the association sought in part to attract tourists to Arizona, and American Indian groups were often highlighted. Not surprisingly, when a continuous route through the State was upgraded and marked as the National Old Trails Road during the 1910s and designated as Route 66 by 1926, it passed through several portions of tribal land. One section of road took Route 66 through the Hualapai Tribal Nation, just past the Truxton Canyon Training School. Surrounded by an agricultural landscape, a dozen or so buildings once stood on the school grounds, but only the two-story brick schoolhouse remains now. The schoolhouse reflects a Colonial Revival style often favored by early 20th-century middle-class homeowners and progressive education reformers. Today, opinions vary among the Hualapai regarding preservation of the property. For many, it evokes memories of a time of forced assimilation. For others, the property is a tangible reminder of a history that, however painful to remember, should not be forgotten. The schoolhouse was listed in the National Register of Historic Places in 2003. The Hualapai Indian Nation owns the building and is currently seeking funds for its rehabilitation and reuse. 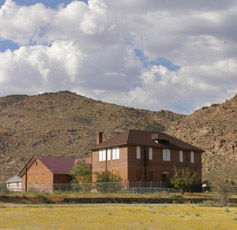 The Schoolhouse at Truxton Canyon Training School is on the northwest side of Route 66 along Music Mountain Circle in Valentine, AZ. It is currently closed to the public for renovations, but can be viewed from the road. The Hualapai Tribal Nation plans to reopen the building as a community center and offices.